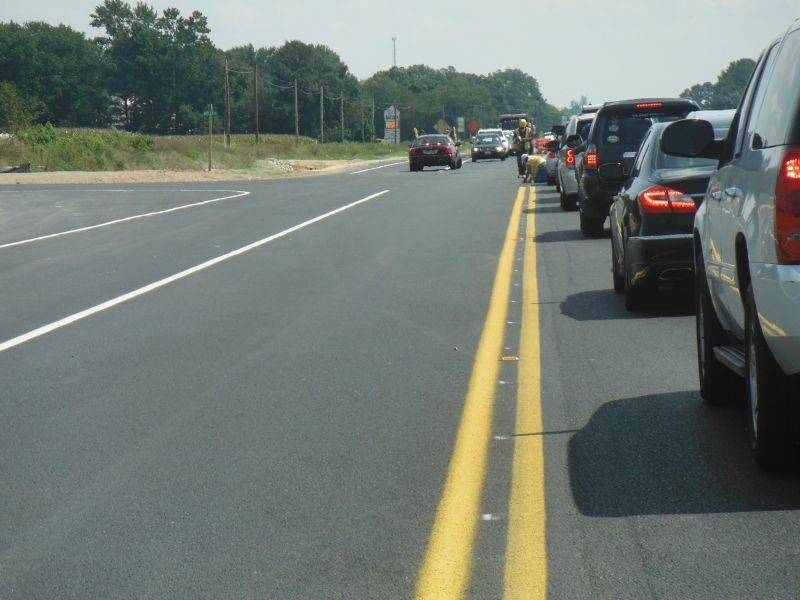 As has been noted elsewhere, Governor Hogan recently determined that widening MD 404 from US 50 to the Denton Bypass was an important highway project deserving of state funds. Others have derided this as being merely a road for people to get to out of state beaches. However, the fact that this old 2 lane road is the most hazardous in the state (according to a state official with a large hat who wished to discuss my rate of travel along this road a few months back) means I don't really care WHO uses it-it's in MD and nobody else is going to make it safer. Many of those who drive along it, especially between Memorial Day and Labor Day, are the type who left their brains on the other side of the WPL Mem Bridge, and who never learned how to pass safely, or the meaning of striped vs solid lane markings. 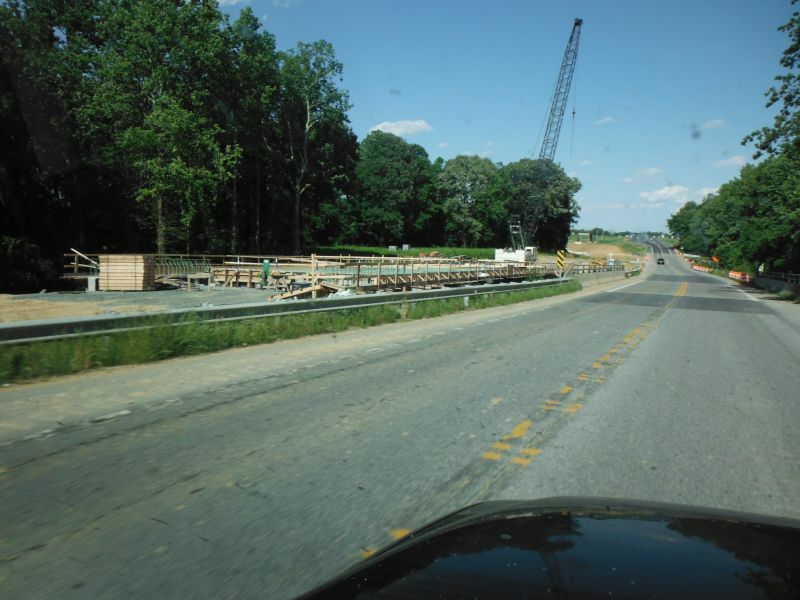 The Denton Bypass was the first 4 lane section, constructed in the early 1980's, and was extended a few miles eastward across Watts Creek and past the MD 16 intersection within the past 5 years. 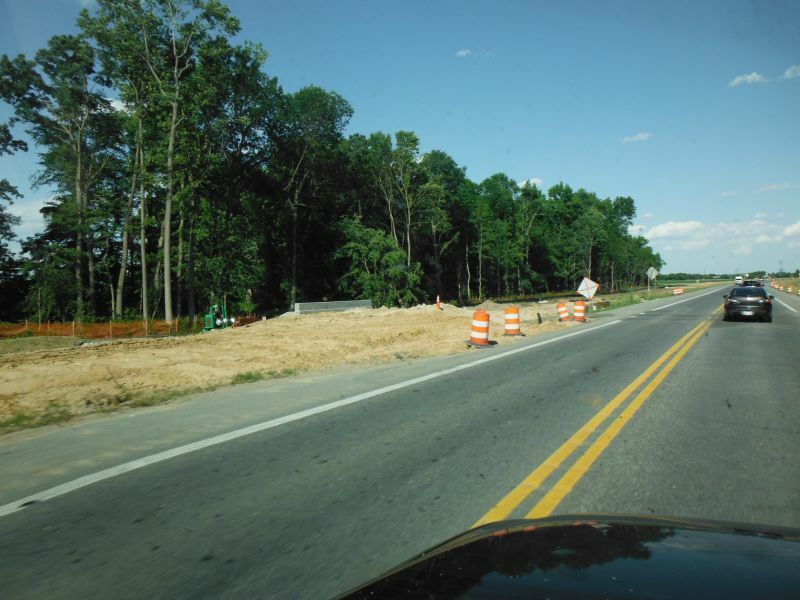 Currently a project is underway to widen the intersection with MD 309 and across Tuckahoe Creek (scheduled for completion in summer of 2017); this is listed as Project 1B. 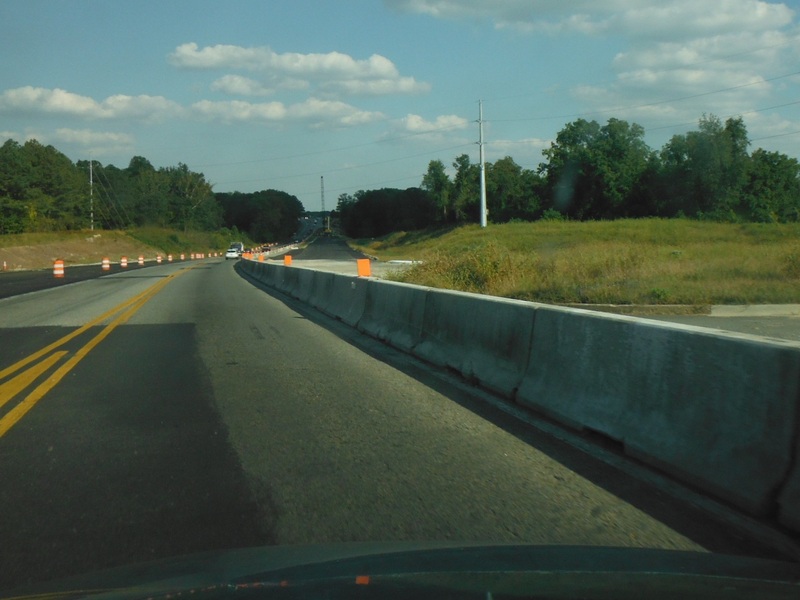 Just east of this, Phase 1A dualized about a mile around the MD 480 intersection-completed in 2012. 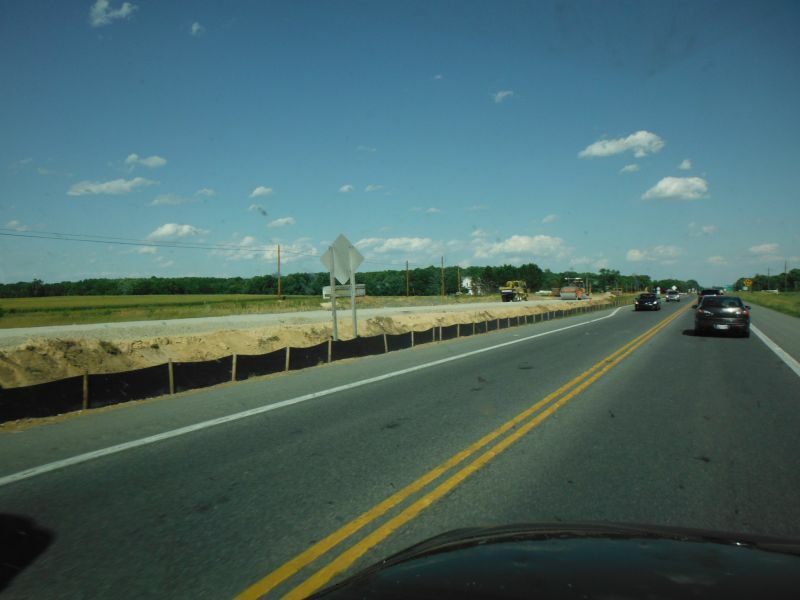 (A few years ago, turn lanes were added at the MD 313 intersection-this appeared to be an SHA maintenance project, because I never saw anything other than SHA equipment working here. This stretch is NOT part of the new initiative.) Otherwise, this road is basically the same as when it was first built in the 50's, and for many drivers it is their only experience at driving on an extremely congested 2 lane road. Based on how far most of the utility poles are from the current roadbed, my guess is the SHA already owns a substantial portion of the RoW. SHA website has long listed this project, cut into phases. Phases 2A and 2B are in the design phase; these involve no signalized intersections or significant waterways, but sediment control and runoff issues nonetheless. The map I just found (linked from http://apps.roads.maryland.gov/WebProjectLifeCycle/ProjectPhotos.aspx?projectno=AW896215) indicates that Phase 2B includes a section just west of MD 309, but work here is underway with the bridge project, so I don't completely trust the map. On Monday, I did see some surveyors working just west of the 309 project, so perhaps that is truly Phase 2B. Some of the wording on the website mentions a Phase 5, but it's not on the map. In addition to needing more funds to address problems with the state's highways, SHA also needs a webmaster. The number of links for this ongoing project that lead to "no information available at this time" or similar is not terribly helpful. A few months ago, the SHA contact on the website did send me a nice PDF showing the work at the bridge, but this document doesn't come up when you click on the "maps" link for this project, so I feel pretty special to have a copy. SHA website also includes plans to 6-lane US 50 from US 301 southward, but nobody seems to be pushing it. It's unfortunate that they will widen 404, but not be able to grade separate the 50/404 intersection. But I guess since there will be a nice bottleneck wherever the 4 lane portion ends, there's no point in enabling more traffic to get ON this stretch of road to begin with. Construction to start Spring 2017. I thought that the long-term plans for U.S. 50 involved grade-separated interchanges at Md. 213 and at Md. 404? And possibly full access control from Queenstown to Md. 404? Looooonnnng term, yes. 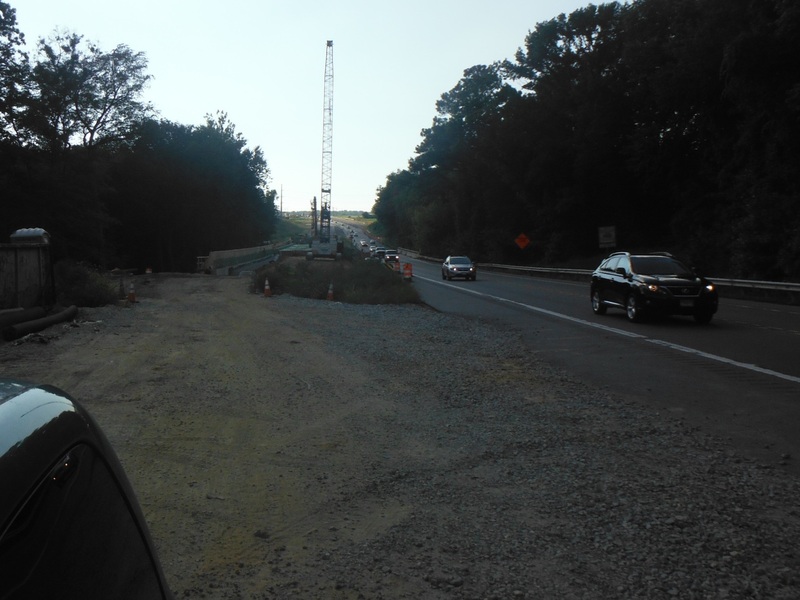 Work on 50 is not part of Hogan's recently announced plan. WB 50 over 301 was rebuilt recently and is still 2 lanes with no shoulder. 50 planned to pass over 404 with a diamond interchange IIRC. Still need to make a left onto 404, but signal would favor that movement. Seems like the problem at 50-404 could be solved with a single flyover, something like what was done where US 17 leaves its concurrency with US 15-29 south of Warrenton, Va.
Not completely. WB 404 to WB 50 is also a major maneuver. And there is some turning traffic in other directions here. Actually I like that idea. WB to WB movement can happen more or less as it does now-it's just a right turn with a yield sign-and leave the rest of the movements alone. The Omar, VA loop ramp isn't what came to mind when I read "flyover", but it could work in this location. I guess it depends on whether we're using hovercraft or US50 towards Easton/St. Michaels gets converted to limited access first. If I was handing out the dollars for highway improvements, I would want a diamond interchange, with a flyover for the 50 EB to 404 EB movement, and the ramp from WB 404 to WB 50 to be gentle and at leas two lanes wide. 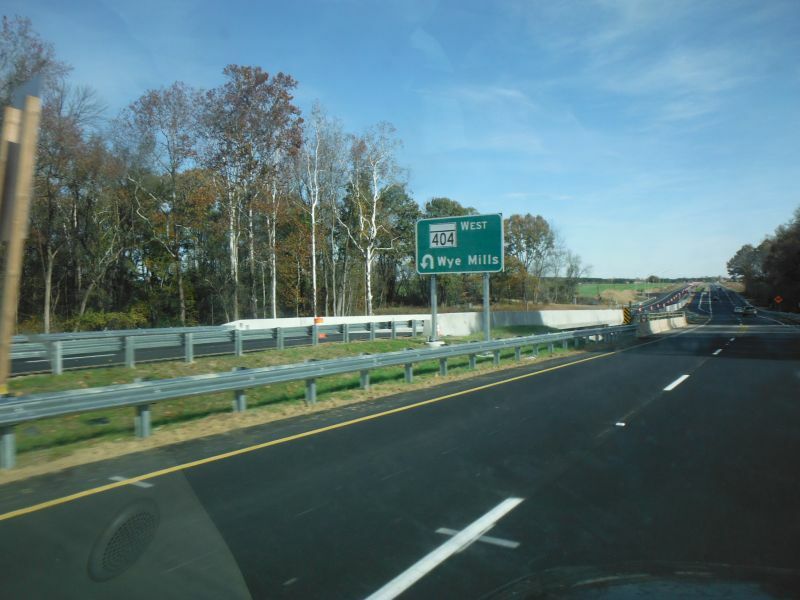 The Queen Anne's County pages in the SHA part of the draft 2015 Consolidated Transportation Program (CTP) has a D&E Program entry for making improvements to U.S. 50 between U.S. 301 and Md. 404, but it is shown as being "on hold." Probably because of a lack of funding. Had a girlfriend that lived in Bridgeville, DE. Too bad we broke up; I would have been all for it. Good link. mdot.md.gov should lend their webmaster to apps.roads.md.gov for an afternoon. I'm all for building an interchange at US 50 and MD 404, in addition to widening the latter and making the former a freeway to where MD 90 splits off near Ocean City, with bypasses where needed (around Easton and Cambridge). Making that drive this weekend... and it would be nice. But it ain't gonna happen. Easton wouldn't really need a bypass...MD 322 could theoretically be converted into a narrow 4-lane freeway with minimal ROW acquisition (though it'd be expensive). But you can pretty much forget a Cambridge bypass. Would require a huge new bridge (likely a mile long if not longer) over the Choptank River plus several other smaller bridges over inlets and wetlands. Easton wouldn't really need a bypass...MD 322 could theoretically be converted into a narrow 4-lane freeway with minimal ROW acquisition (though it'd be expensive). As long as I can remember, there have been a lot of businesses fronting on U.S. 50 in Easton. But I doubt that the big money in Talbot County (compare and contrast with the big money in Fauquier County, Virginia) would like the idea of a Md. 332 bypass at all, even though there is no Talbot Environmental Council at this point in time. But you can pretty much forget a Cambridge bypass. Would require a huge new bridge (likely a mile long if not longer) over the Choptank River plus several other smaller bridges over inlets and wetlands. Prior to the 1980's, the congestion to cross the two lane draw span over the Choptank River at Cambridge could be epic during the summer months. But that bridge, and the one at Vienna were replaced (and Vienna was bypassed entirely), making for a much easier ride to and from Ocean City. Why would you want to bypass Cambridge? Has one of the cheapest gas stations in the region. Trappe used to have a gas station called "Lowest Price" (It looked like it was remodeled into something else last month). I remember at least once noting that it didn't, in fact, have the lowest price on US-50 in Delmarva. Not that anything of the sort will/would ever get built, but something limited-access more closely following (and maybe utilizing) the 404 corridor into Delaware, then something built as a N/S corridor (near 113?) would probably be the way to go for a limited-access solution to the beach areas, as opposed to the US-50 corridor - mostly due to the Cambridge issue listed above. Which is why I started http://www.aaroads.com/forum/index.php?topic=16372.0 . I know what that was like. I distinctly remember a horrible backup thru Vienna for the 2-lane drawbridge over the Nanticoke in the mid-late 80's on the way to the beach,. It was those trouble spots that led to my family using MD-404/US-113 for a handful of years instead. 11 miles from US 50 to Denton to be dualized by fall 2017. Some portions already are, and one section is in progress. Surveyors have been spotted in the woods and fields adjacent the 2 lane stretches the last month or so. That bottleneck gave alternate meaning to Billy Joel's lyric line, "When will you realize Vienna waits for you". SHA’s contractor will begin construction of a new westbound span this winter. As Beltway, froggie and RoadPelican have posted in the main MD thread, neither MD nor DE have any serious plans to widen the portion between Denton, MD and Georgetown, DE. MD's plans for widening/interchanging US 50 (US-301 to MD-404) have been on planning books for decades, but has never been funded. DE is more interested in moving people north-south within the state, with much less attention being paid to east-west traffic. The upcoming interchange at DE-404/US-113 will help some, as long as the US-113/US-9 intersection gets interchanged first. The plans for a diamond interchange at the intersection of US-50 and MD-404 have been online for quite some time. I can't find the email, but sometime in 2015 I asked an SHA engineer if he thought the diamond interchange (traffic light for left turn at the base of the ramp) would be adequate for the traffic volume from EB US-50 to EB MD-404. He stated that the light would be set to favor the left turning traffic and their studies showed that would be sufficient. Meanwhile, 2 lanes of 404 Sunday summer traffic all trying to nose into the one right turn lane onto WB 50 will be problematic.